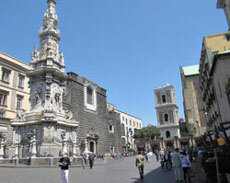 The first visit will be the Cathedral of Sant Gennaro, patron saint of Naples, which houses a vial of the Saint's blood that is brought out twice a year, on the first Saturday in May and 19 September, and usually liquefies. According to legend if the blood should fail to liquefy, then something bad will happen to Naples.The second church to be visited is that one of the Seven Works of Mercy where the well-known painting by Caravaggio's Seven Works of Mercy is exhibited.You'll continue on foot along San Gregorio Armeno where You can admire numerous shops with creative nativity figurines in all variations. Besides the Jesus- and Madonna figurines You will also find detailed copies of all household objects, gastronomic delights, exotic animals, and sometimes even caricatured politicians. Santa Chiara church is the next stop, built in 1310-1340 by King Robert d'Anjou, who is also buried in the complex. 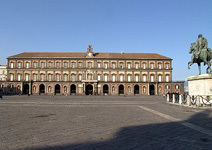 The cloister is not included in the visit.Afterwards, You'll be guided also in the Gesu' Nuovo Church, which is the most important church ever built by Jesuits in Naples. It is called "Gesu' Nuovo" (New Jesus), because the Jesuits had already built another Jesus Church in 1568, which therefore is now called "Gesu' Vecchio" (Old Jesus). Your adventure lasts 2 hours and half with me, rediscovering the most important treasures of the POMPEII. 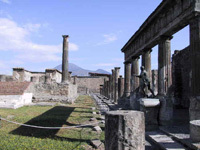 Enjoy this walking back to the past discovering the city covered by the ashes during the terrible Vesuvius eruption of 79 A.D.Pompeii is considered the best preserved city in the World.!!! 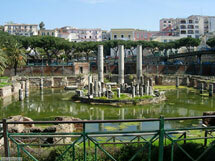 I want you to enjoy with me a great Visit of Pompeii ruins, classical archaeological journey through the ancient city. Herculaneum was founded, according to tradition, by Hercules. Like Pompeii the Roman town was buried during the AD 79 eruption of Vesuvius. 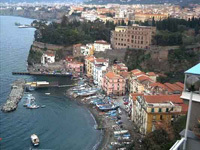 Numerous craftsmen and many rich and cultured patricians were drawn to the resort of Herculaneum because of its beautiful setting, overlooking the Bay of Naples. 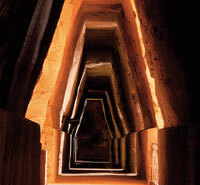 In 1997 Herculaneum was included in UNESCO's World heritage List. 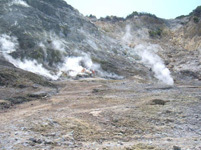 Herculaneum is broadly divided into five sections which are delineated by the two main streets (decumani) and three other thoroughfares (cardi). The town has various examples of different types of dwellings, all of which were overwhelmed by the sea of mud seeped into every nook. The particular interest of a visit to Herculaneum is that all timber structures (frameworks, beams, doors, stairs and partitions) were preserved by a hard shell of solidified mud, whereas at Pompeii they were consumed by fire. The houses were empty, but death caught up with the inhabitants as they tried to flee the city or make for the sea. 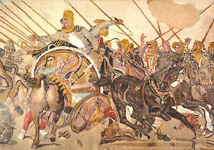 The visit will include : the Farnese antiquities (the marble statues and busts, and the great collection of engraved gems and cameos) on the ground floor; the mosaic of the Battle of Alexander (with other mosaics, the Dancing Faun and an introduction to the adjacent Gabinetto Segreto) on the mezzanine; the antiquities from the Villa dei Papiri; and some of the paintings on the piano nobile. The religious houses of the austere Carthusian Order founded by Saint Bruno and each known as a charterhouse (chartreuse, certosa) were deliberately established in locations away from the court and city but, in the case of Naples, high above, rather than distant from, a city that gradually climbed the hill to surround it. Little of the 14th-century church and cloister is apparent beneath the rebuilding by Giovanni Antono Dosio in the late 16th century, upon which the lavish decoration of the polychrome marble (see p.24) designed by Cosimo Fanzago and Domenico Antonio Vaccaro was superimposed. The monks finally left in 1866 but frescoes by Micco Spadaro illustrate the persecution to which they had been subjected in England, and frescoes by Belisario Corenzio illustrate Silence, Obedience, Penance and other ordinances by which they lived. 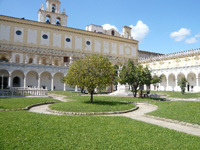 Soon after 1866 Fiorelli began to convert the monastery into a museum, parts of which we will visit. See the essay here on the presepi of Naples We will give special attention to paintings in S. Martino by Guido Reni, Ribera, Lanfranco and Luca Giordano, and to sculpture by Pietro Bernini, Fanzago and Sanmartino. 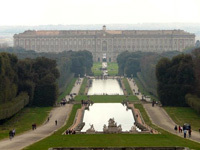 30km to the north of the city, Caserta. Louis XIV's Versailles was the model in many respects for Caserta but Versailles was far surpassed in drama by Luigi Vanvitelli's architecture here. The sculpture of the story of Actaeon in two episodes by the great cascade is perhaps the most successful garden statuary ever created. The king of course also hunted here. 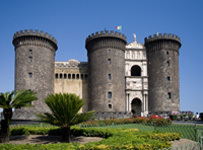 Maschio Angioino (or Castel Nuovo), the most famous monument in the city. 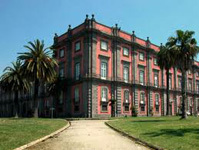 Building was started by Carlo I D'Angio', who after defeating the Swabians took the throne of Naples and Sicily and transferred the capital from Palermo to Naples. One of the most skilled artists of the time, the great Giotto, was called for the interior decorations,. 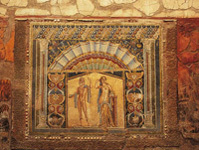 In fact, he decorated the Palatina Chapel, although few traces remain today). In 1454 Alfonso I D'Aragona completely rebuilt the fortress to its present day Gothic-Catalan appearance. The masterpiece of the Maschio Angioino is without doubt the Triumphal Arch of Alfonso I (situated between the two towers at the entrance), a valuable work of Neapolitan Renaissance by Francesco Laurana. The Temple of Serapis (Serapeo), so-called for the statue of this Egyptian divinity (which today is housed in the National Archaeological Museum of Naples), is a unique testimony to the dockland and commercial district of "Puteoli". In reality the temple is one of the best examples of "Macellum""Pronaos" of this Macellum are three marble columns which, with small pock marks made by molluscs which burrow into the stone, are superb examples of the geological phenomenon pf bradyseism. The Romans already knew the Solfatara since Imperial times. Strabone (66 B.C. 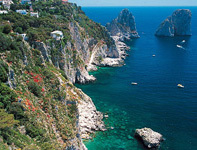 - 24 A.C.) gives the most ancient written testimony coming to us in his "Strabonis geographica", indicating it with the name "Forum Vulcani", dwelling of the god Vulcano, entrance to Hades. The Solfatara opens up officially to visitors in the year 1900, although it was since time immemorial destination for its renown vulcanic phenomena, for the therapeutic properties of the sulphurous waters and for the hot saunas; it was in fact included among the forty most famous thermae of the Phlegreaen Fields since the Middle Ages.